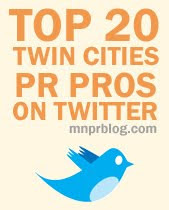 Minnesota PRSA is the ninth-largest chapter of the Public Relations Society of America (PRSA), the world’s largest organization for public relations professionals with nearly 32,000 professional and student members. A strong, active part of Minnesota’s communications community since 1953, Minnesota PRSA’s membership is comprised of nearly 400 corporate, agency, independent, non-profit and government public relations professionals from Minnesota, the Dakotas and western Wisconsin. Through its programs and services, Minnesota PRSA delivers on its– Exponent PR took home Best in Show for its Wading into Uncharted Waters communications program, in conjunction with WinField United, as the Minnesota chapter of the Public Relations Society of America (Minnesota PRSA) held the 40th Annual Minnesota PRSA 2018 Classics Awards on April 19 at The Grand 1858 at Minneapolis Event Centers. The annual event serves as a celebration of top communications efforts executed within the chapter territory, which includes Minnesota, the Dakotas and western Wisconsin. In total, 46 awards were presented during the evening, honoring professional achievements from 2017. Included were 37 awards highlighting strategic communication elements and communications programs, and four student honors. Holli Henderson (Young Professional Award), Paul Maccabee (Padilla Award), Jack Nachtigal (Dr. Willard Thompson Scholarship First Place) and Rachel Oehlke (Dr. Willard Thompson Scholarship Runner-up) were also recognized for their individual achievements. Exponent PR beat out 21 other program award winners en route to taking home the evening’s top prize. The Wading into Uncharted Waters campaign aims to educate stakeholders about the use of fresh water in agriculture and the long-range effects of not protecting this vital natural resource. Specifically, the message initiated a conversation regarding the responsible use of water in farming. Minnesota PRSA recognized Paul Maccabee, of Maccabee Public Relations, as the Donald G. Padilla Distinguished Practitioner Award recipient. The award is given to an outstanding individual who has made selfless contributions to the public relations industry and demonstrated exceptional professional achievement. Holli Henderson, working for U.S. Bank, was recognized as the Minnesota PRSA Young Professional of the Year. This award is given to a rising star in the chapter who has contributed to their organization, industry and community. Jack Nachtigal, a student at the University of Minnesota, was the first-place finisher for the scholarship, netting him a $2,000 prize and complimentary PRSA membership. Rachel Oehlke, also a student at the University of Minnesota, was selected as the runner-up, earning a $1,000 prize and complimentary PRSA membership.